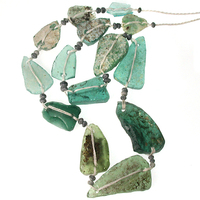 These ancient Roman glass beads present an amazing opportunity to own a part of history. 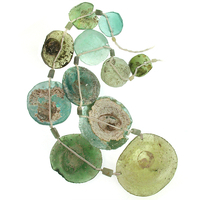 Glass vessel fragments have been recovered from a Roman glass-works rubbish heap along the Silk Road in Bamayan, 60 miles north of Kabul, Afghanistan. At the time of their manufacture, 500 B.C. to 1100 A.D., this was the area known as Bactria. The glass has been carefully reworked into usable jewelry parts and exhibits the interesting opal-like effects of being buried for approximately 2000 years. Some of the glass still shows the markings of its original vessel form. 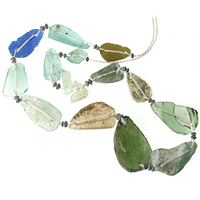 These pieces resemble beach glass in their soft colors and smooth shapes - and they've been drilled for use in jewelry. Each unique strand has been individually photographed for an accurate representation of colors and condition. blue and green 20 to 42mm coins and 54mm bottle bottom with coins New! blue and green 20 to 46mm coins and 56mm bottle bottom with coins New!